No one will believe how affordable these are. It’s the age old problem. Well-designed things are expensive, so dressing well must be expensive. If you’re like me, you’ve spent your entire life oogling over expensive things you can’t afford, and used up an unreasonable amount of time trying to recreate the look and feel with frugal alternatives. Unfortunately, you usually get what you pay for. Especially with watches, the cheaper options never stack up to their designer counterparts. The designs are dated. The metal feels cheap. The metal strap has some ugly expanding bracelet from 1980. The numbers look like they were printed in Times New Roman. That’s exactly what Jake and Kramer wanted to combat when they founded MVMT. Why can’t you find a clean, minimalist watch for less than $250 made with durable materials from a company so sure of their product they offer a two year warranty? Hoping to get some initial startup money, they posted a modest Indigogo campaign in 2013 seeking $15,000 to produce their first line. Within 50 days they surpassed that goal by more than 1,400% raising $220,000 and becoming the second most funded fashion campaign in Indigogo history. But most likely you don’t need me to give you an introduction, as MVMT watches are the dominant watch brand of social media influencers big and small, frugal and luxury. In fact, while the Indigogo campaign was successful, their impressive growth has been almost entirely through social media.The minimalist design means they slip between casual and professional settings with ease. Their focus, not only on simple colors like my white face and tan leather strap highlighted above, but design forward options like black on black and rose gold finally offer guys a well designed and affordable watch they can be proud to wear. I get complimented on mine nearly every time I wear it. 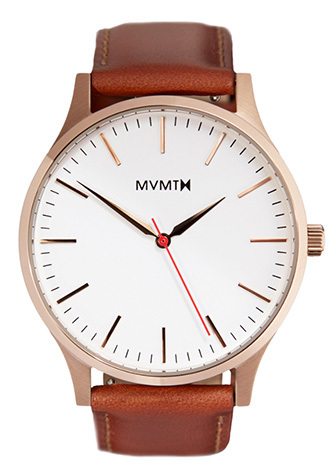 MVMT is the Everlane of watches; cutting out the middlemen and huge markups that come with them, designing in-house and selling directly to you on their website. But just because these watches are affordable doesn’t mean they’re delicate. Whopping in at 45mm and the brand new 40mm line, these watches are practically tanks. Tired of cheaper watches looking dainty on your massive wrists? These big guns made of 316 low carbon grade stainless steel using the highly praised Japanese Miyota Precision quartz movement aren’t going to throw in the towel very easily. 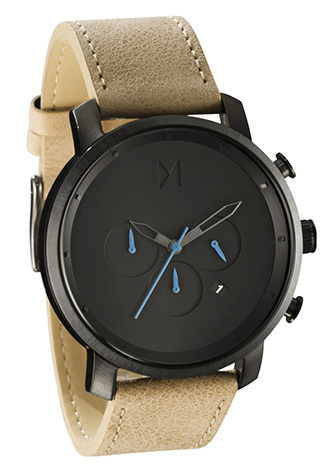 Offering free shipping and free returns, the MVMT team is so confident in their line they offer a 2 year warranty. If it fails you, they’ll replace it. Now we’ve teamed up with MVMT to give FIVE lucky Primer readers brand new wrist wear, all you have to do is enter using the widget below. Here are some of my favorite designs. Don’t want to take your chances with losing? I’ve included their 15% off Black Friday only pricing below. Entering to win one of the 5 watches is simple. Use the widget below to enter. You can enter up to 4 times! 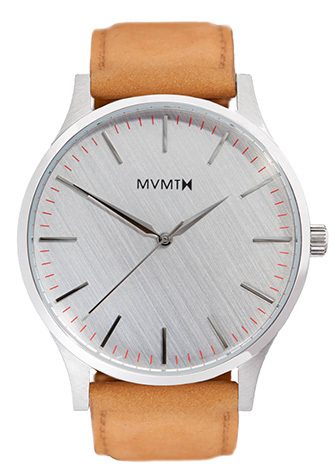 MVMT Giveaway – 5 Lucky Winners! These look great, but if 40 mm is their smallest case diameter then that’s a pretty big downside. The Ideal and classic case diameter for watches is IMO between 30 and 38 mm, larger than 40-42 mm looks flashy and doesn’t fit under shirt cuffs properly. For that price you can’t beat the style of these watches! $100 for a watch that size and style is hard to beat! Really love that chrono in gunmetal black. really like those, they remind me a lot of Skagen. MVMT are great, and I love the black/gold chrono. My God MVMT is beautiful. Does it comes in women’s? Very similar to Nixon designs, and that’s not a bad thing! I have 2 of these watches. The Chrono Gun metal/sandstone leather and the Black/tan leather. I love both and wear them often. I cant go a day without getting a complement with both. I would highly recommend this brand especially if you like the style. The only down side is they don’t make an automatic yet and I think they probably will as they expand they’re line I just normally shy away from quartz watches but couldn’t resist the style and price. LOVE the brown band with the black face! I want the one with the black face and the dark brown leather. Sold out, though! Nice to see an affordable dress watch on the market. I really like the simplistic design and color scheme nearly all their watches. I don’t currently have any watches with a face size that large but I’m excited to see how that works with my wardrobe. Thanks again, Andrew. These watches look awesome! I’ve been looking for a new one since my old “The Horse” watch kicked the bucket. I’ve seen these watched all over Pinterest. It’s good to know that a website I trust puts faith in them and they aren’t just spamming my Pinterest feed. These look real nice. I’ll have to add these to the wish list for Christmas. these look great. nice find on the deals! 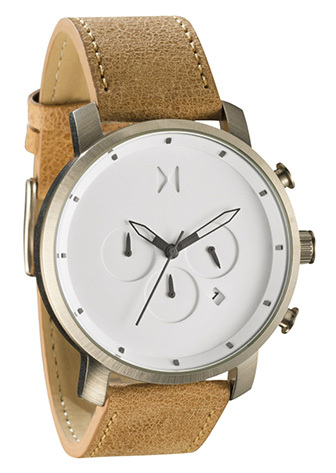 I’d love the white face and caramel coloured strap! Gorgeous! First learnt about mvmt here on primer magazine while ago. Been big fan since. On my wishlist, noted as mvmt (any!) as I can’t pick one concrete model. Will definitely get one, but it would be super sweet if I could win one. I am in love with the black/tan and the silver/brown “The 40” models. I think they would go the best with my work and casual wear. These are such great watches! I have wanted one of these for the longest time! Come on free watch! These are great watches – I bought silver with brown band for my son. Wouldn’t mind one for myself! I see some great styles! those are great watches! I’m looking to add a few watches into my collection that have leather straps. Great looking watches. Nicely understated. 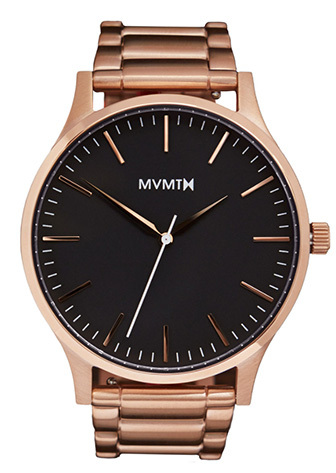 I’d love to have: ‘The 40 – Rose Gold/Natural Leather MVMT’ watch. Stylish and affordable. Good design! I would like to win 🙂 Thank you for sharing those ones. These look rad! Always wanted one. Those are sharp watches for $100. Agree with MNuta, 40mm as a default is a bit on the large side, but does help to make the minimalism more apparent at the same time. Would love to see how the 40 would sit on my wrist. MVMT watches are the best! Really good brand! I’ve been wanting one of these forever! They are amazing! Definitely on my Christmas list. Loving the look of those chronographs! Followed both on Instagram – to bad I was already following on Twitter. Love these watches. Beautiful. Hoping one magically shows up in my mailbox or stocking soon. Absolutely in love with the black on black. I really like that white chrono. Understated and sharp. 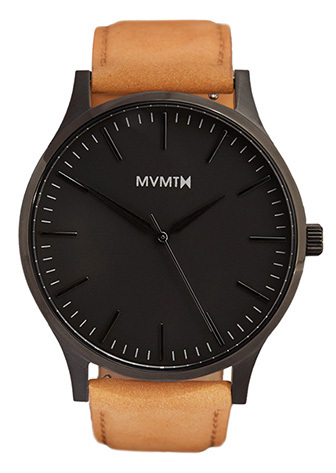 I have always wanted a MVMT watch! Really like the black faced ones. These watches look great and the price is great too. These watches look amazing and the price well wow! Seems like solid value for the money. Price in the beater range but looks outside it. Sounds good to me. I would love to have the 40 Black/Tan Leather watch. It has a truly superb look! Great posts guys, you make the “design/price” problem a lot easier. I love the simplicity of these (much like my Skagen) and the price is hard to beat. These are so sweet!! Love the black face! As always thanks for the awesome contests! Great watches! I like this giveaway. I hope I can have one. Hope to be one of the lucky ones!! Very nice looking watches. I love the design. I’ve wanted one of these for a while. Just got the 40mm in silver and tan leather, and man this thing is sharp! The case is fairly slim too, which makes for a comfortable fit on my smaller wrist. Can’t speak to the durability/reliability yet, but the styling is on point if you’re a minimalist kind of guy. Some of these look great, though pretty large. Those watches look great, I’d love to snag one! the rose gold ones are awesome! The first row on the left. Something about that strap and style of watch face is great looking. These watches are pretty rad! I’ve been seeing these watches all over social media especially the white face and brown leather strap. I just love their designs. Nothing beats a clean, simplistic design. I’ve been curious about this brand for some time now but still haven’t taken the plunge. Very minimal and stylish watches though! They’re definitely on my radar now. My everyday is a Hamilton, but these are really sharp. I’d love to try one out. These look fantastic! Ive become obsessed with watches lately and these look right up my alley. These watches are great! I own one myself and I get a lot of compliments from other people at how astounding they look! Gorgeous watches! I love their minimalist aesthetic. I personally love the rose gold/brown leather watch. That should look good on any wrist. Love the style, price can’t be beat. It’s an interesting style. I’d probably choose one with a lighter leather band on it. 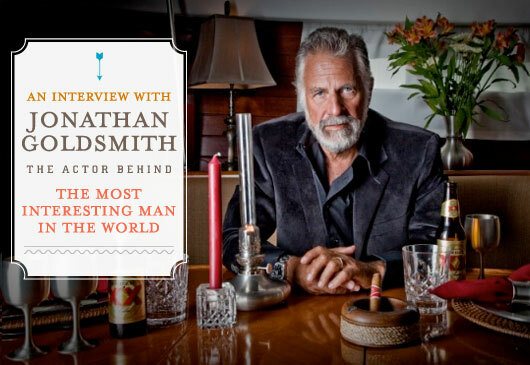 These look great and would be very sharp for some of my interviews coming up. Really like the design of these watches. Those are some stylish watches. Thanks for the giveaway! 🙂 They all look amazing! 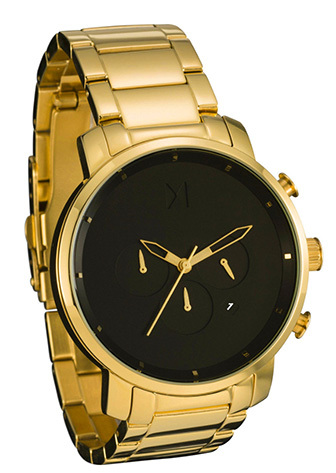 I’d love to have the Chrono Black/Gold watch the most. Thanks for the chance! Definitely been interested in these watches for a while now. The styles have evolved since it first came out and I’m finally ready to start looking into one now. I really like MVMT watches. I plan on buying one after the holidays. My son says these are SICK! I’d love to win one for him! These are very nice watches and the price is definitely right! These watches look really sweet!!!! really dig this watch, especially at this price point. It would be cool if they made an automatic at some point. These look amazing, would be so excited to win one! Great looking watches for great prices! Is on top of my wishlist for some time now. But never gave myself an excuse to buy extra watch when I’m happy with my current seiko. I love the fact that these watches are quality ones without an expensive price tag! Beautiful wrist candy! Great price point for the style. I see them on Instagram and tumblr all the time. Great watches! would love to have one for the hubby! Always a fan of the minimalist look. The 40 – Rose Gold/Brown Leather would look wonderful for the man of my life. These are very stylish watches! Excited to win a watch! I need a watch to look like my life isn’t a garbage fire. These look awesome! I’d love the THE 40 – SILVER/TAN LEATHER one. Even though its they’re quite minimalist, they make a big impression. I’ve been looking for a new watch to wear at work. These would be great. I’ve always admired the clean classical, and simple design sensibility of these watches. I like the brown leather and black face one! What gorgeous watches, all of them. The rose gold and brown leather is my favorite. 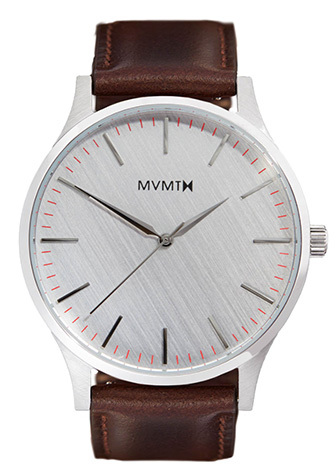 MVMT’s watches have a look that’s clean, classic and fresh. Primer, as a place for men to commune to discuss the various aspects of fashion, style and everyday life, is very similar to MVMT, because their approach is also clean, classic and fresh. Glad that this post has brought all of us lurkers out of the shadows. G If I had a choice, I would choose the White/Tan Leather. ood luck Gents and thanks to MVMT and the staff at Primer for the opportunity to win a watch! I love the rose gold options. 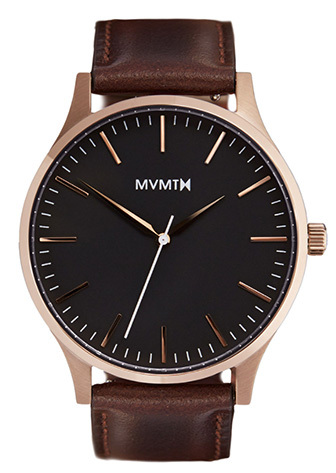 MVMT watches look stunning! The white chronograph is a beautiful thing! Got my brother hooked on these, but have yet to get one myself – time to jump on board. Love the classic, minimal looks, not just in accessories and watches like The 40 – Silver/Brown Leather, but in all aspects of attire. Nice clean design, shame the rose gold and leather one is sold out! The gold one I like the most. I tend to stick with leather straps though. I got a black MVMT watch with a tan strap and it has quickly become my go-to watch. Fantastic style and great quality. I’m in. Funny how you get hundreds of comments during giveaways. I know, I know…merely a coincidence! I like the minimalistic nature of the watch faces. Almost always a good look. While they definitely fill a need and a price point I could see a lot of these styles looking dated within the next 5 years outside of the normal traditional looking face / band combos. 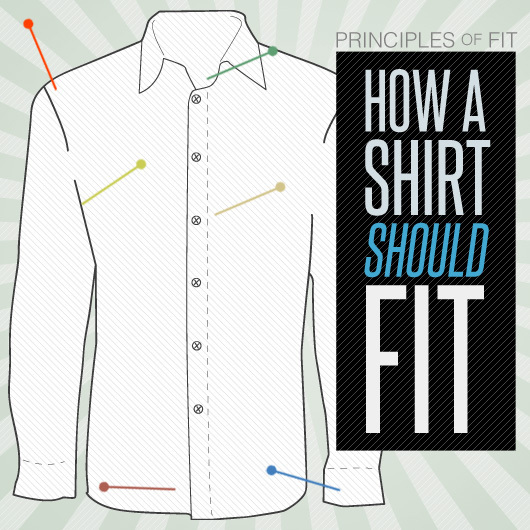 That being said great style and seems like a great addition to anyone who has the basics covered. I’ve been looking for a watch like this for a long time, I love the designs, and my brother has been needing one for ages. I currently have two MVMT watches and love them. That all black watch with the tan band is one sleek watch. Great for an all black option if you switch out the band with a leather or nato strap! This is the perfect Christmas gift!! Wow they all look amazing! Right now I have an old Bulova, a Caravelle, and a Moto 360 (my daily) but when I’m spending the whole day or night out its more convenient to have a plain old watch. Really hope I win! Great designs for the basic watches but I’m not a fan of the chronos. They’re too simple. For me a chrono is supposed to be a little complicated, that’s part of the appeal. Some of those look amazing! The rose gold case with the leather band is a beautiful classic style. As a big watch enthusiast it would be awesome to win one of these! I love that white face watch! Love that black face with the blue hands. Really like the minimalist look of these watches. I have a new found love for watches and I couldn’t imagine a better watch than the 40 to start my collection! MVMTM is gorgeous! My pick! Wow! So many great styles it’s hard to choose. If it were for myself I would choose the womens’s rose gold/white. If I were to gift one to my husband it would be the 40- rose gold/black. Absolutely stunning watches! I love the designs of these watches. The Rose Gold and leather looks amazing! These watches look great! Definitely a timeless and classy design! Looks similar to Nixon. I wonder how they compare? Nixon’s can be real heavy. Love the simplicity of Skagen. These remind me of them. Really like the Rose style. I have heard good things about these watches on the Interwebz. Fantastic deals on some beautiful watches! Love the look of these! The brushed looking gray faces are sweet! Nice; I think the sand colored straps match my preference best. Ugh… I feel like a watch junkie jonesing for this watch! I’ve been looking for a leather band watch. 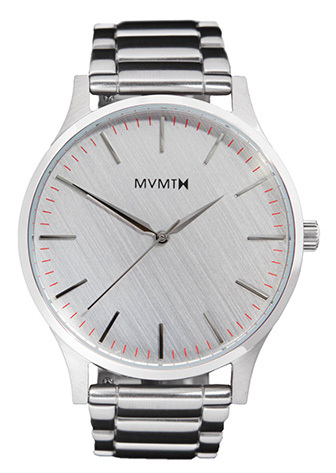 These MVMT watches are simple, affordable, and stylish. Love the simple but classic designs. The 40 – Black/Tan Leather as a Christmas surprise ! Love the simple design! Great prices! Good luck to every one in this contest. Not gonna lie though…. I want to win! Great looking watches given the price. Any word on quality as compared to other watches at this price point? I’ve frequently heard good things about Japanese movements. Amazing watches – this site continues to get better and better! I think that the rose gold one is absolutely beautiful and I’d love to get that one. Even if I don’t win, I would buy it along with a few of there other watches. I did read a comment on the size of the watch, so I’m very interested to see how big it is in person. I think the Chrono Gold / Black Leather & Chrono Black Leather look amazing! Really love the rose gold with tan leather! I would like it in 36mm too. I almost bought one of these. Like the minimal look but decided to think about it more. Time to graduate from Timex haha, not that there’s anything wrong with them. The dark brown leather with the white face looks great. Silver/tan leather makes simple look so classy. Rose gold/natural leather also a great option. Asked for a few for Christmas.Would be cool to have a nice little collection! I love the one with white face and tan strap, wish to win it! I just discovered the brand. Did a bit of research afterwards and they have a nice story and a great idea. I really liked their approach. Thinking about buying one these days. As for you Andrew, you`re doing a great job. Primer Magazine is quite awesome. I really appreciate what you`ve created here. Keep up the good work. They are all gorgeous!! I really love the HE 40 – SILVER/BROWN LEATHER. The band looks so fancy and the face is beautiful! I would love to surprise my husband with such an amazing watch!! He needs one so badly!! Love the chrono gun with the leather straps! I would definitely love to grab one of the white/gold/lighter brown straps to up my watch game at work. These watches are awesome. Definitely on my must buy list.